He killed 77 people in a bombing and shooting rampage in 2011. MASS MURDERER ANDERS Behring Breivik’s court case against the Norwegian state over his prison conditions, which he likens to “torture”, will take place in the jail where he is being held, a court ruled yesterday. Breivik killed 77 people in a bombing and shooting rampage in 2011 because he was opposed to Norway’s multiculturalism. He has complained repeatedly about being held in isolation, which he argues is a violation of his human rights. His court case had since previously been scheduled to take place March 15-18, but the question of where the case would be heard had yet to be determined, given the security problems posed by moving Breivik from the prison. The state had proposed holding the trial in prison, and Breivik’s lawyer agreed to the idea. “Practical considerations and security issues justify that the case be heard at the Skien prison,” about 100 kilometers southwest of Oslo, the Oslo district court ruled. The prison conditions could be more closely studied on site, it added. On 22 July, 2011, Breivik killed eight people in a bomb attack outside a government building in the capital and later murdered another 69 people, most of them teenagers, when he opened fire at a Labour Youth camp on the island of Utoeya. 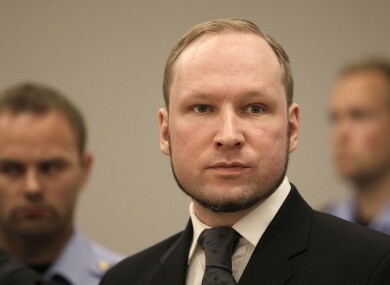 Breivik, today aged 36, was handed a 21-year prison sentence in August 2012, which can be extended if he is still considered a danger to society. In a report published in November, Norway’s parliamentary ombudsman said Breivik’s solitary confinement risks turning into “inhumane treatment”. Email “Mass murderer Anders Breivik taking case against state over prison conditions ”. Feedback on “Mass murderer Anders Breivik taking case against state over prison conditions ”.